During blistering hot days, it's quite uncomfortable to relax in outdoor space! 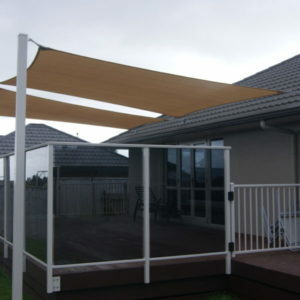 So, why not use a shade sail in your backyard or veranda to avert scorching sunrays and make full use of your residential premises? A shade sail is designed to withstand New Zealand’s harsh weather while enjoying the outdoors and making your home aesthetically pleasing. We offer a great range of bespoke shade sails that make it safe to go out in the sunny season. Explore our cost-effective collection & choose from different options to match your existing exterior style.